In medium saucepan, combine milk and pudding mix; mix well. Cook over medium heat, stirring constantly until mixture boils. Remove from heat. Place plastic wrap directly over pudding. Cool 1 hour or until completely cooled. Trim off short ends of quick bread loaf. Cut loaf into 9 slices. Arrange slices in ungreased 13x9-inch (3-quart) glass baking dish, cutting to fit. Sprinkle liqueur over bread. Spread with jam. Top with raspberries and pineapple. Spread cooled pudding over fruit. Beat whipping cream in small bowl with electric mixer at high speed until soft peaks form. Add powdered sugar; beat until stiff peaks form. Spread over pudding. Cover; refrigerate at least 1 hour to blend flavors. Store in refrigerator. 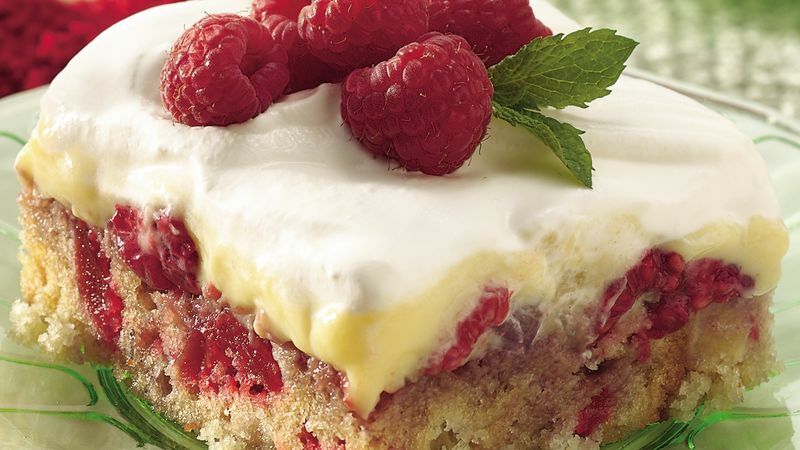 Cut into squares; garnish each with raspberries and mint. Trifle is a classic English dessert typically made in a tall glass bowl to show off its beautiful layers of liqueur-infused cake, jam, fruit, pudding and whipped cream. Our trifle is made with quick bread and layered in a pan so the dessert is easily cut into squares. For extra-rich flavor, prepare the pudding with eggnog instead of milk. No time for baking? Try frozen pound cake in place of the Pineapple-Cherry Quick Bread. Use one nine-inch loaf; thaw the cake before cutting it into 12 slices.